It may surprise you that I’m a relative new-comer when it comes to southern gospel music, at least in some aspects. Less than a decade ago, if you had mentioned Gold City or Legacy Five to me, I would have been as likely to guess that they were movie titles as singing groups. Though I didn’t grow up with a treasure trove of gospel CDs, or with my radio tuned to a gospel station, I knew many of the songs. I knew many of the songs because, from the time I was born, three times a week I was in church singing them and hearing them sung. And for my entire childhood and into early adulthood, I only knew one songbook. My church was one of many Baptist churches in the Southeast that utilize the Church Hymnal, known everywhere as the “Red-Back,” for congregational and choir singing. I am no scholar on the history of this hymnal. But what I do know is that it was published in 1951 by Tennessee Music & Printing Company, now Pathway Press, which is the publishing arm of the Church of God based in Cleveland, Tennessee. (Pathway Press still sells them like hotcakes!) It contains standard hymns, traditional gospel songs, and even Christmas and patriotic numbers. But what sets it apart from many hymnals used in churches today are the convention songs. The first 150 or so pages of the Church Hymnal are an all-star roster of some of the greatest quartet and convention songs to come out of the 1930s and 1940s, written by giants of the genre like Albert Brumley, Vep Ellis, Luther Presley, Lee Roy Abernathy, and others. This is the music I cut my teeth on, and the music I still love today. I’ve been thinking recently about the impact this songbook has had on my Christian life, and the impact it has had on gospel music at large. Both are quite immeasurable. But that doesn’t mean I can’t try! I decided to look at my personal gospel music collection, some 16,000+ tracks strong, and see just how pervasive therein are the songs of the Church Hymnal. If you don’t like numbers, you may get a little overwhelmed. But my statistical nerdiness extends to everything that interests me, including gospel music, so buckle up! The 410 pages of the Church Hymnal contain 429 songs. (Now is a good time to mention one of the book’s idiosyncrasies: the pages are numbered, not the songs. Some songs cover two pages, while some pages contain two songs. If you’re told to sing 382, for example, you’ll need to be told which song!) Of those 429 songs, 244 are represented in my personal music collection. See the chart to right to see which songs are the most popular. 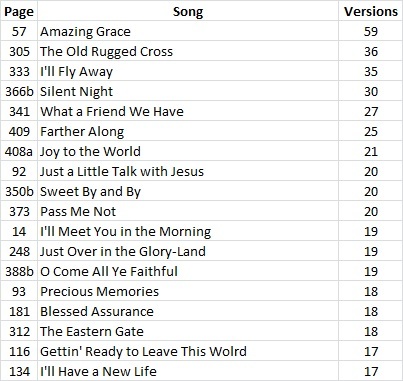 The least surprising thing you’ll read in this post is that I have more versions of “Amazing Grace” than any other song in the Church Hymnal (or any other song, regardless of book). Also listed are the Christmas carols that just about every southern gospel group has recorded at some point. The remainder are classic hymns and gospel songs, most of which you can probably sing without much of the book’s help! 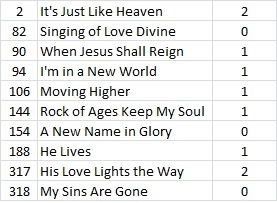 Besides the 18 songs listed to the right, there are 44 more songs from the Church Hymnal for which I have 10 or more versions, and 65 more songs on top of those for which I have 5 or more versions. As you can easily tell, there are a lot of very popular gospel songs in this songbook. So we’ve established that a lot gospel artists have recorded songs from the Church Hymnal. Now let’s look at specifically who has recorded them, and how often. 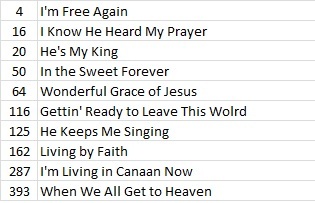 Take a look to the left to see which gospel artists have recorded the most of these songs, based on my music collection. The column titled “Tracks” contains the total number of recordings the group has made that are (or that contain in medley form) songs from the Church Hymnal, including duplicate versions. The far right column “Songs” contains the number of unique such songs recorded by those groups, that I have in my collection. 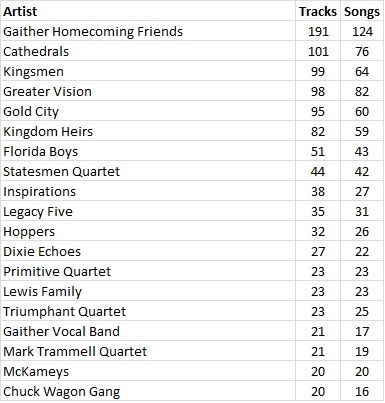 So on Gaither Homecoming albums that I have, 124 different songs from the Church Hymnal have been recorded, a total of 191 times. This list contains many of the longest-lasting and most popular groups on the history of southern gospel music. They’ve recorded a lot of songs in general, not just a lot of songs out of one songbook. It’d be perhaps more interesting to see which groups most frequently record them. Oh, wait, I have that, too! Out of a total of 16,371 total tracks in my collection, 1,586 of them are or contain songs found in the pages of the Church Hymnal, an overall percentage of 9.69%. Using that as a baseline, check out the chart below to see the percentage of each group’s tracks that are from the red-back. (Minimum of 100 total tracks in my collection) Now there’s an eye-opener! I don’t believe any individual in gospel music today has done more to promote and preserve the legacy of the Church Hymnal than Gerald Wolfe. If you go to enough Greater Vision concerts, or listen to Gerald talk enough, you’ll hear something about the red-back. I’ve heard Gerald rattle off page numbers of songs off the top of his head, a skill that I share with him, though he would probably whip me in a “Church Hymnal Drill”. Greater Vision doesn’t just talk about the hymnal…they bank on it, with their music. They recorded four albums over a period of nine years (the “Church Hymnal Series”) that contain 50 total tracks, recorded with delightful, straight-up arrangements that remain true to the “book”. Even besides the dedicated series, Greater Vision has recorded plenty of them scattered on other albums. The result is that their percentage of Church Hymnal songs is significantly higher than anyone else’s. The Kingdom Heirs, third on the list, have recorded three “red-back” exclusive projects themselves. I would attribute the Gaither Homecoming’s high place on the list to, by the series’ nature (especially early on), recording a higher proportion of older songs in general. I’m glad we have artists like those above who are still recording this old-fashioned music! Now that I’ve given you more information than you ever wanted to know, I’d like to share some of my favorite songs from this cherished book of my youth. See to the right for 10 of my personal favorites, in no particular order except page number. They are mostly convention songs; I especially love the ones with lots of moving parts. I’d love for you to share with us any special memories you have of the Church Hymnal. Has it had an impact on you and your love for gospel music? What are some of your favorite songs? Great post all around. You have quite the head start on me, because ten years ago at this time, I was completely unfamiliar with Southern Gospel AND had never so much as heard of the red-back! I have at least four versions of “It’s Just Like Heaven” – two by Greater Vision, one by the Happy Goodmans (1975), and one by the Blackwood Brothers (1962). Nice…my only two versions of page 2 are the GV versions. GV also did “His Love Lights the Way” on one of their Church Hymnal CDs, and I have the recent Perrys version. For “New Name in Glory,” I am glad to see it on a Gaither Homecoming recording, though Marching to Zion is one of the ones I don’t have. Using SG History, same goes for “My Sins Are Gone,” which Bill put on Singing in My Soul. Good job, Mr. Gaither! I need to get Marching to Zion and Singing in My Soul! The last “goose egg” up there in my post, “Singing of Love Divine” is a mystery. The only times I’ve heard it is when the choir at my childhood church sang it, and I watched Youtube video of a group of folks doing it recently. SG History comes up empty. It’s a good one! I wonder if there’s anyone else out there who knows it! Also worth noting: two of the songs on that “underrecorded” list have only been recorded by bluegrass groups, at least in my collection: “Rock of Ages Keep My Soul” (DL&Q) and “Moving Higher” (Primitives). SGHistory comes up empty on those, too. Some quartet would do good to try one of them! We have used the Churc Hymnal all my life. We call it the King James Version song book:). I’ve have requested an iPad app with Pathways Press different times. Red Back Book every service. Oh the memories of how the Church Hymnal has influenced my Christian life. Thinking upon my years at Tabernacle Baptist College in Greenville, SC, apart from the King James Bible, no other book had as much influence on Spirit-filled chapel service as the old Red Back! For years our theme song was #150. My favorite to play on the piano was #20. Oh the memories! Great, great post Brian. I’m glad you and I both “cut our teeth” on the greatest hymnal of all time! Brother Crout: I have some slight memories also in playing organ while you were on the piano and chimed right in there with you. I too enjoyed the chapel times and the choir at Tabernacle and singing that tenor part. It was all done for God’s Glory!!! I found a homeless ministry advertising on Craigslist for a pianist. When I called, the pastor seemed anxious to inform me that they used the “old red church hymnal”. Having just given a less than impressive two hour audition/interview at a “high church”, this was music to my ears (pun intended). He explained that he grew up in the Church of God (again, almost apologetically). I couldn’t articulate fast enough to him that although I grew up Baptist I knew that songbook like the back of my long bony piano “fangers”. I sputtered that this collection of music was iconic for me and all those with whom I spent so many happy hours practicing, singing, picking out parts, laughing, messing up (I was so nervous in those early days of playing the piano). Having not opened this hymnbook for nearly 18 years (12 years out on the trail, and the rest playing Praise and Worship, which I love also – “IN CHRIST ALONE”, “HOW DEEP THE FATHER’S LOVE”, “WONDERFUL MERCIFUL FATHER”), I longed to “bang it out” again without someone whining about how loud I am. Many places, from nursing homes to mental hospitals to churches were humbling experiences in that I sensed my contribution was not suitable. Several times, I was told that outright. The last little church I played in used this book but immediately pointed out that I was too fast and had too much flourish (they couldn’t find the melody). I know how to play soft and slow (I’ve played for enough funerals and lukewarm people to prove that). A gospel pianist can go just so long before he wants to tear up all 88 keys. Enter the opportunity to do just this. The pastor said the magic words, “I want you to come in there and give it everything you got, fast and loud”. I had not even shared with him all the above. I went and practiced with a small “choir” Saturday and we were there for four or five hours. This tiny sanctuary might have looked like a cartoon with the walls bulging from 20 years of pent up spiritual and muscial expression, not to mention with the accompaniment of the pastor on a humongous theater type organ. When we got into “I’ll Meet You in the Morning”, I could feel the influence and spirits of Ann Deaton, Carol Burns, Jimmy Burns, Louis Powell, Leonard Lindsey, Naomi Kelley, and Bonnie Edwards. What a great training ground I had as a child. Others like Angie Garrison, Evelyn Rowland, Judy Steele Nalley, Mrs. Preston Garrett, Mrs. Horne, Hobart Stephens, Rose Castro. My earliest idols were my brother Erik and cousins, especially Edie Turner (that’s who she was before she became the famous Edi lol Chlo Ann and Kim Turner. Sunday was the dedication service for the church, wedged in between commercial buildings on a main thoroughfare and a high traffic area for Knoxville’s huge homeless population. HOLY PILGRIMS CONGREGATIONAL CHURCH is open for business – that is, the commission, taking seriously the GO YE, and ALL THE WORLD, parts of the gospel. In all my years of church attendance, I have never come this close to seeing people the way Jesus must. I had asked to turn the piano around so I could see people worship. The scene could have been one from the early church, meeting in homes and grottoes, on hillsides and by lakeshores, witnesses on the highways and byways. This 150 year old building, that was leaning before a crew of mostly homeless people “arighted” it, was filled with those who have not been, are not now, and will never be accepted in most churches. What followed makes an enthralling story of spiritual passion, courage, and faith leading to the birth of The Salvation Army. Young people, often as young as 18, opened the Army’s evangelistic work in mining towns or even new nations and the Army expanded globally. The Army’s social work was born, compelled by love, reaching out to prisoners and downtrodden”. I looked again into the faces of HIS people, who came of their own accord, seekers of, and in, the Spirit. We were not handing out money, meals, or anything material. The doors were open and they came. Addicts, alcoholics, the wanton, some unshaven, a few unwashed, mixed couples – different races and orientations, children who weren’t wearing Dimples and Dandelions, or Zulily, elderly with only a simple tired smile to offer anyone scrutinizing their social graces, or lack thereof, and others who probably just didn’t “look right” to most of the passersby. Then there was me. Fatter than ever, smelling right nice thanks to a $2 stick of Sure deodorant, and self-assured with my rediscovered gift for being a blessing to others – (pause for laughter). Sure I was having a good time, but I fell deaf to my own talent while receiving new sight -the Holy Spirit at work. Hands were raised all over the church, tears, praise and thanks were in perspective, and it had nothing to do with me. How dare I proudly, albeit enthusiastically, run the chords in rapid fire succession to “I Want to Know More About My Lord” and “The Dearest Friend”, loving the sound that MY hands were creating, thinking for a moment that I was sent to these people to be THE blessing. I was envious of each one’s time in the Spirit. I wanted to know how the smiles came so easily. What do they have to rejoice over? They were testifying to the truth that they had already found a hiding place. They had discovered that their souls were held in the cleft of the rocks and shadows where life had discarded, renounced, disowned, and forgot them. Every mistake, disappointment, confusion, misunderstanding, regret, embarassment, humiliation, sin, need for affirmation, stifled rage, and silent scream was being covered for eternity with LOVE. Your comment spoke right to my soul. Thank you. I can play “churchy”…but sometimes just have a need to tear it up on those keys. Thank God there is an outlet to do so. Southern gospel cannot legitimately be labelled “bar music”, even though the naysayers try. To feel like I have an offering to bring? That I’m not “showing off”, just playing joyfully, the only way I know? That I fit somewhere? That I’m perhaps useful to my King, using this talent He gave me? That this IS a talent, and not an abomination?! These are things that Southern Gospel music is making real in my mind. Finally. Thank you for a wonderful article and the sweet memories! Another great thing about this hymnal is it is one of very few (possibly the ONLY full hymnal) that still has the music written using shape notes. Shape note singers understand their parts, which serves to make the singing fuller and better. For those who aren’t aware, there is a Facebook page dedicated to this hymnal. The Facebook title is “CHURCH OF GOD “the old red-back book” CHURCH HYMNAL” (https://www.facebook.com/groups/67568888351/). It has some wonderful music videos featuring many of the songs in the book. 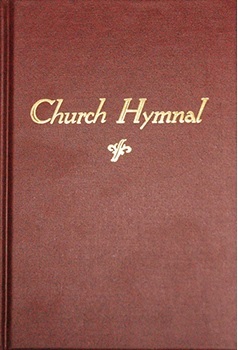 Also, a printable hymnal index can be found online at http://www.pathwaybookstore.com/Item/32393/ClassicRed-BackHymnal/99. Thank you again for your article. It was a blessing! Page 16 I know He Heard My Prayer!!! This is probably my favorite. So hard to say that but that song still ministers to me this day. I love O Happy Day as well!!! So many songs in this book that really are awesome.. In fact, don’t think theres not a song in there I don’t like.. ha ha.. My church does a huge Red Back Church Hymnal Singing each year.. This will be our 3rd year to do it and it’s totally awesome. Many churches form out of state come to this event. You can see the info on Facebook in the events page. Red Back Church Hymnal Singing at Gardendale First Baptist Church. You have a special invitation from me to come join us. We have a huge mass choir each year. Last year we had over 241 singing in the choir and over 2000 in attendance. It was amazing. Come join us. Everyone loves this book and so do I…. And by the way the singing is April, 26, 2014 at 6pm..
Where is the Gardendale Church ? Bob Farris.. Gardendale First Baptist Church is 9 miles north of Birmingham on interstate I65 north. I attended StampsBaxterSchoolOfMusic and have become quit the RedBackChurchHymnal enthusiast! Great article and homage to a hymnal that has truly stood the test of time. I thoroughly enjoyed reading this. The truth is.that I find myself singing at least one song from “The Red Back” to myself, (and to The Lord) at least once a day. These songs were undoubtedly inspored from on high and have been a help, comfort and source of strength for my entire life. Thanks for sharing and God bless! Just thinking ahead. We will have our 5th annual Red Back Church Hymnal Singing April 9, 2016 at Gardendale First Baptist Church. Located in GArdendale Alabama. 9 miles north of Birmingham on interstate 65 north. Exit 271. Singing starts qt 6pm.. IF interested in singing in the mass choir, please be there at 4:30. See you there.. Going to be another incredible year of singing.. Look for us on Facebook in the events section to be posted with info this September!. some red book hymnal singings in our area Charlotte NC and Gastonia NC…I would love to play for one. Absolutely in my opinion the best hymnal out there, and I personally own three copies, wow, one of them is green. (It’s the exact same as the redback hymnal so that counts right?) I attended a free-will baptist church growing up, and I can only remember ever using two hymnals, one of course being the redback, and the other being “Songs of Inspiration” or something like that. So hard to pick only my top 10, I just can’t do it. Just purchased for my momma, she raised us up in the Church of God. It was a Good surprise! I know I’m a few years late finding this but it is a great article. Brian, you and some of the commenters have put into words what I have tried to explain to other about the Red-Back. I’m 64 years old and I was raise since birth in the Church of God. My grandfather on my mother’s side was a Church of God minister. My uncle on my dad’s side was the SC state overseer and a Church of God pastor. He also took care of financial responsibilities of the whole Church of God organization in Tennessee. One cousin just recently retired as Dean of Students at Lee University. Jerry Goff another first cousin has written a lot of gospel songs and once had a Gospel group, Jerry and the Singing Goff’s. Jerry is no longer Church of God, I think he is Baptist now. All of that to say I’ve been Church of God all of my 64 years. Well maybe except for my time in the military and my wild years. But it was music from the Red-Back that brought me back to the fold. I had stopped going to church and one Saturday night my mom asked me to please go to church with her. I went with her and they were singing from the Red-Back, then the congregation stood and started singing ‘How Great Thou Art.’ First I started getting chills and then I couldn’t stop myself I practically ran to the altar and the service had hardly begun. I knelt and start calling on the Jesus and the tears started pouring out. It was like every tear cleansed a part of my darkened heart and let more light of love in. That’s been some years back now, but those Red-Back songs still get to me more than any other Gospel Music. Again, thank you for this article. I’ll share it with others to help me explain what it does to me. Thrilled to share that we had our first Hymn Sing (Red Back) in October last year, followed by a Christmas Carols Hymn Sing. Had 66 at our first and 75 of our church members at the second. We have now scheduled sing more hymn sings for 2019 at our church and are anxious to see how it goes. It was very well received during a super busy time of the year. Many are looking forward to it anxiously and we’re all having a lot of fun recalling our younger days with church hymn sings. We were pleasantly surprised to learn that several of the high schoolers are even interested in joining us. I am 58 years old now and my childhood was spent with the red back hymnal. IFrom even before I can remember I was taken regularly to a country church in rural North Carolina. I am so grateful now! Little did I know then that the songs I sang over and over were scripture being tucked away for later in life. Many times now, I’ll find myself humming or singing one, and what power and comfort they hold! My sweet Mama took us to church come rain or shine. My sister and I didn’t know then the wonderful gift she gave us.im old enough now that I’m ordering a large print and it’s goid to know that in all these years it’s still the same!